Picked up a pair of near spotless Wharfedale 505.2's today and plugged them in for a listen tonight. They had a decent rep back in their day (late 80's) and to be fair, do sound pretty decent. Bass is more powerful than you'd think for the size, though perhaps slightly 'boxey', but the midrange is silky and articulate, vocals sounding natural with no hint of harshness, which may be down to a slightly recessed upper mid / treble quite typical of 80's speakers I've listened to. Probably just the thing for taming bright sounding Japanese 'rack systems' of the day, but perhaps unnecessarily stifling the higher res high quality systems. Was thinking of the Celestion 44s as a 'refurb and pass on' type project, but after swapping out the Wharfedales for the Missions and then back to the celestions, I think I'm gonna find it hard to find something else with such a fluid tangible midrange so they're a keeper. The Arcam Alpha amp & CD have gone on the 'bay tonight for £65 for the pair - which if you discount the ridiculously daft way I got them, is a bit of a steal. Anyone after a properly solid, powerful sounding pairing would do well there. Goodmans Magnum K - forget all you know about the cheap tat they make now - these are 1970's giant slayers with their 12" bass units and thunderous power. Amazing speakers bettering many modern offerings. Wharfedale Linton II. Wife friendly but very popular back in the day. 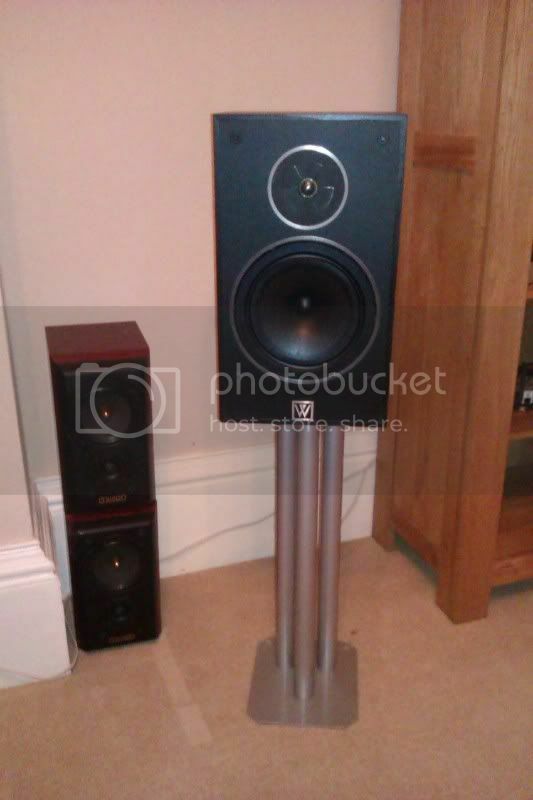 Whafedale Laser 40 diddy bookshelf speakers. Jordan Watts slimline wall mount speakers - again popular back in the 70s and a bit rare today! 2 x Leak Stereo 20 amps. One original, one upgraded with modern components as a bit of an experiment. Yes, the modern one sounds better. Goodmans Module 80 receiver. Nice match for the Magnums. Stunningly realistic with voice and simple acoustic material. I'll replace the reservoir caps soon... they're a bit fried. Several cassette decks as previously mentioned. And no doubt other tat I've forgotten. Will swap for beer tokens - or bike bits as I have an Alpinestars to build this winter. There's a story behind that! Years ago, I was using my wife's account (she was running a women's shoes business at the time) and as she was vat registered and everything, it was causing grief with her books, so she said "open another account to sell all your crap". I'll even manage to get it into the living room without too much complaint from wifey. I'm going to go 2 channel first then 2.1. Is there any point going 3.1 i.e with a small centre and eventually 5.1 with small discreet rears given that I have a moderately sized living room? I'm thinking small satellites would be a bit too under powered to make any differnce, or is the function of the rears quite minimal anyway? I'm no expert in home cinema but from experience, the rears do add atmosphere. I've been given the nod for a 5.1 set up so I'm going for that from the outset I think. My only worry is it won't be enough to cover the room. Wouldn't worry about the rears too much. A good sub and front left / right would appear to be most important. Then you have a hope of ok music reproduction too.